Activate HD Voice directly on the device. It can take you up to 30 minutes to download the software, depending on network conditions, and up to 60 additional minutes to install the update. This means a total process time of up to 90 minutes. Keep in mind that during the installation you can't make or receive calls, including emergency calls. The Windows Phone 8.1 software update is delivered over-the-air via Wi-Fi only. The software is delivered in 2 separate downloads and takes up to 90 minutes to install. As the update is installing, customers will see a black screen with 2 white, moving gears. When complete, you'll see an "Update is done!" message and can go about using your phones, with all your settings, data, apps, and so on just like they were before. Please make sure customers complete each of the separate downloads. 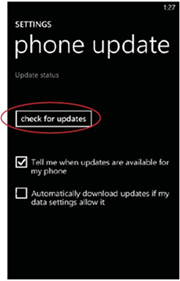 If you continually select the "postpone" option, the software will not update to Windows Phone 8.1. OTA user initiated - Follow these instructions if you would like to manually search for an upgrade on your device. OTA server initiated - Follow these instructions if you receive a notice on your device indicating there’s a software update available. This process allows a user to navigate through the device options to seek updates. From the Home screen, tap Settings > phone update > check for updates > download.